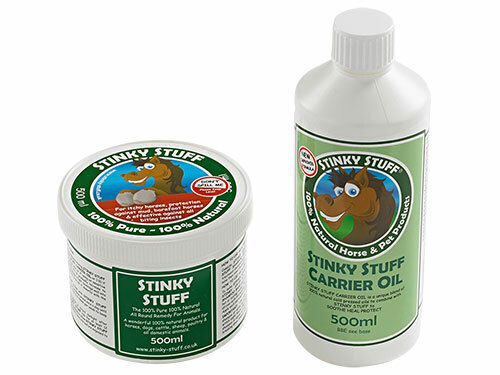 The Stinky Stuff Rub & Soothe Pack combines Stinky Stuff with Stinky Stuff Carrier Oil to create a soothing massage rub for horses with itchy, irritated skin. This oil rub calms itchy, irritated skin. Soothes redness and helps with minor cuts and abrasions. Helps to promote hair regrowth. Provides relief from the harmful effects of wet and muddy conditions and create a barrier to protect against future irritations.